Prof. Choodamani Nandagopal, a renowned Art Historian of International repute. with Doctorate from Mysore University. 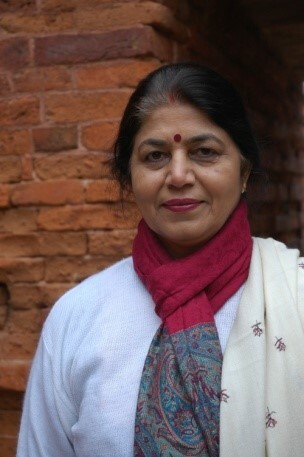 She is awarded four International and two National Research Fellowships, including the first scholar to receive the UK Visiting Nehru Fellowship at Victoria & Albert Museum London, UNESCO Silk Road Fellowship at Paris, UNSW Senior International Fellowship Sydney and University of Exeter Visiting Professor Research Fellowship UK. Her first National Fellowship was from ICHR. The government of India has conferred to Dr. Choodamani, the prestigious Tagore National Fellowship recently for 2019 – 21 at National Museum Delhi. Dr. Choodamani is an academician of high repute in Art History and Cultural Studies served as Academic Head and established Art History and Research Department at Chitrakala Parishath. She was Academic Head of IGNCA Southern Regional Centre Bangalore, set up Dept of Cultural Studies at Manipal University and Jain University. She is an author of 20 International publications and 7 Kannada publications. She has published 70 research papers to her credit and invited as a key-note speaker in International conferences. Guided 17 Ph.D. scholars, and 20 M Phil candidates. Her recent publication is ‘Ritual Enactment in Temple Tradition published by Indira Gandhi National Centre for Arts New Delhi. She is known in the academic circle of Sri Lanka, invited first by the Govt of Sri Lanka to conduct a workshop on Temple Architecture, later member of Association of Asian Heritage, at the conference on Ananda Coomaraswamy and several conferences organized by Kelenia University. She delivered the lecture on Coomaraswamy at the Peradeniya University in 1999. A paper on ‘Cultural Interface between India and Sri Lanka’ is published in the International Conference Publication by ICCR and National Museum. At present, she is on her research project ‘ Anuradhapura and Amaravati Cultural Interface’ sponsored by India-Sri Lanka Foundation.